Figure A89. Uskhy anomaly, interpreted as the Ushky slab, with (horizontal) [vertical] cross sections through (A)[D] the UUP07 p-wave) and (B)[D] the combined SL2013 and S40RTS s-wave models at 1170 km; C) the location of the modern geological record that we interpret to have formed during the subduction of the slab. 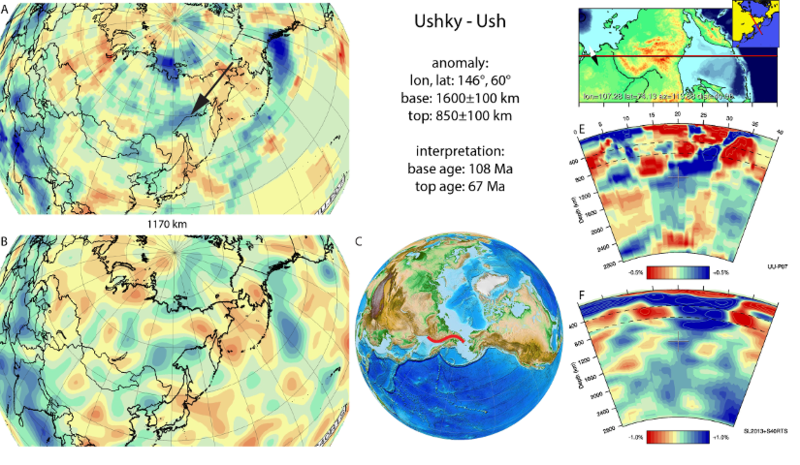 The Ushky anomaly (Figure A89) is located below northeast Asia in the upper mantle and uppermost part of the lower mantle. It is E-W trending and at ~920 km depth it connects to the N-S trending Sakhalin slab in the west, and the NE-SW trending Kamchatka-Kuriles slab in the east. The anomaly’s location is consistent with the inferred paleo-position of the continental margin Okhotsk-Chukotka arc. According to Nokleberg et al. (2000), the arc started activity in the Cenomanian-Santonian and ended in the Miocene. In recent model of Shephard et al. (2013), the arc was presumed to be active in the middle-Late Cretaceous (108–67.1 Ma). This was based on the study of Stone et al. (2009), giving a 90-67.1 Ma age range, and Akinin and Miller (2011) who gave a 107-77 Ma age range. This was followed by the accretion of the Okhotsk block to Siberia, followed by an eastward jump of subduction to the Kamchatka-Kuriles trench. We adopt the age range given by Shephard et al. (2013) to reflect the subduction period of the anomaly that we interpret as the Ushky slab.